State Rep. Randy Terrill (R-Moore), widely known for his anti-illegal immigration legislation, could become known for something new: his close, and possibly illegal, ties to the Oklahoma Public Employees Association. Two articles from the Daily Oklahoma point out his unsavory relationship with the labor union. For years, state employees home addresses have not fallen under the Oklahoma Open Records Act, and have not been made public, for privacy and security reasons. However, Terrill tacked on an amendment to a Conference Committee Report on House Bill 2245 at the very end of the 2009 legislative session that enables "any statewide organization limited to state employee membership with a minimum membership of two thousand dues-paying members" to receive a list of addresses for all state employees in order to send a once-annual mailing. HB 2245, the Oklahoma Criminal Illegal Alien Repatriation Act of 2009, dealt with illegal immigrants in state prisons - not exactly a similar issue to unions getting access to state employee mailing lists. 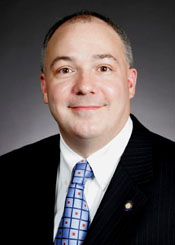 OPEA named Terrill the 2009 legislator of the year, in part for his legislation giving them access to the mailing list. Terrill is a member of the OPEA union. The Oklahoman reports in more detail here. In the 2008 campaign, the OPEA political action committee contributed the maximum $5000 to Terrill's reelection campaign. An individual or PAC can only contribute up to $5000 to any campaign for the entire election cycle. In August of 2009, OPEAPAC gave a $5000 maximum donation to Terrill's 2010 campaign. On October 21st, Terrill deposited the check into his campaign account. However, Terrill has not filed a 2010 campaign committee with the State Ethics Commission. State law requires for candidates to file with the Ethics Commission within 10 days of receiving more than $500 in contributions. Since he has not filed a 2010 account, the donation was reported as going to his 2008 account - breaking ethics rules, since a campaign can receive only $5000 per cycle from any donor. The Oklahoman has another article on the issue here. Terrill's sneaky, questionable actions and close ties to a labor union bother this conservative activist, and should concern every conservative in the state of Oklahoma. Conservatives decry slipping in major changes to law or policy at the very last minute when it happens in Congress, or when Democrats do it. When a "conservative" legislator does both of these things, red flags should fly.